When setting up my XBMC instances, I wanted to have a central machine in my house serve up all my media, and for that I chose to use my Mac OS X Lion machine. Since my XBMC machines are being powered by Windows 7 I ran into a bit of a predicament. In Mac OS X Lion, Apple started using the SMB2 protocol that Microsoft introduced in Vista back in 2006. Naturally this would be a welcomed change since the original protocol has been around since the Windows 3.1 days, but XBMC doesn’t include support for SMB2. There are some alternative protocols you can try using, such as AFP or FTP, but even those have their drawbacks. XBMC 11 added built-in support for AFP shares which is file sharing protocol that Apple prefers. In my case AFP isn’t even an option since Windows doesn’t natively support AFP, which means my XBMC machines don’t see the AFP shares. As far as the FTP goes Apple removed that functionality in Lion, but it can easily be restored. I didn’t want to go that route though because FTP connections limit some of what you can do with the media in XBMC, such as not being able to delete videos directly from the XBMC interface. So for me Samba/SMB was still my best option. After some searching I came across a free app called SMBUp that restores the old-school SMB protocol compatibility in all its glory on your Mac OS X Lion install. You just have to download the app, open it up, and it will install a version of Samba that works beautifully with XBMC. As you can see in the screenshot above you’ll be provided a full interface for managing all of your shares, and you can even enable guest access to shares making it even easier to hook XBMC up to them. A lot of geeky people will argue that using the older protocol will drastically limit your transfer speeds compared to other methods, but I have not found that to be the case. In fact before installing SMBUp I was able to transfer files at 92MB/s to a Windows machine, which was being done with the newer SMB2 protocol. After installing SMBUp I saw speeds to the same machine reach 98MB/s, and that was with the older protocol. Not bad, and that shows that my gigabit network is on par to my expectations. Tip: Most people treat the Samba and SMB terms as one-in-the-same, but in reality they are not. SMB/CIFS is pretty much only found in Microsoft Windows, whereas Samba is the free and open source version that you’ll find in the Mac and Linux OS. 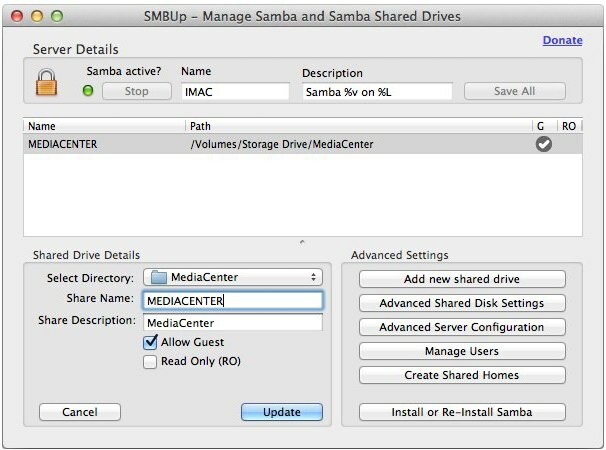 Samba was originally developed by reverse engineering SMB.